Vermont Instruments, run by George Morris and Adam Buchwald, where I took my sabbatical and began the luthier journey (is it ever over?) has put up a new web site. Our class picture (Fall 2008) is on the home page, taken on the last day before we went our separate ways. My guitar was still in pieces after I put in the inlay on the headstock, so I held one of the tenor guitars that was hanging around (literally) the shop and Adam had just strung up. They’ve also put up a testimonials page, in which yours truly is pictured WITH my freshly-strung guitar, and a link to my chronicles on this blog. (See sidebar links.) A recognize a couple of my photos mixed in there, too. 🙂 If you are interested in taking the class, head on over there. Adam is also teaching a repair class, which sounds good, too. I’m happy that they have added an alumni section, where presumably a forum will appear where we can ask questions and trade tips. So far, no login info yet, but it’s coming. 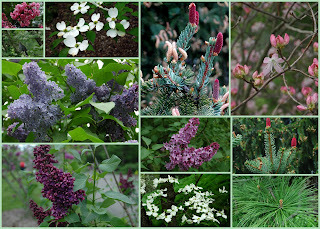 Went for a walk in the Arboretum yesterday before the Lilac Sunday/Mother’s Day crowd descends on JP today. Spectacular flowering trees and lilacs!! I posted a few of the best photos on picasa – click the image above to go there and see the full versions. You can almost smell the lilacs from these. Lots of happy birds were tweeting, too. What’s up with our kids breaking their wrists?? Did they not drink enough milk? Not enough sunshine? Is frisbee really a dangerous game? You tell me. 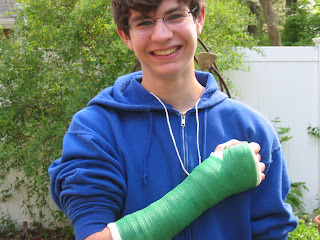 Zach decided to join Lucas in the “wrist hit parade”, and he’s looking quite proud of his cast. Luckily we had good care down the street and didn’t have to suffer through the hospital system. He’ll have the cast on for 4 weeks. Here’s a Stefan Grossman tune I learned a long time ago and relearned recently. It’s from Yazoo Basin Boogie, the tab book I have from way back (KM-102) that cost me $1.25!